This is probably the last post of the year. As you would expect, it is about a science fiction story. Author happens to be, well, Ahem! Me! Yes! Me! So obviously it can't be a review. It is my second science fiction story and fourth speculative fiction story to make it to a book. Before you start pouring in all your congratulations on realizing my dreams and stuff, let me tell you, it is still not that novel I have been talking of writing for over a decade now – it is just a single short story in a collection of short stories. But that is still something, isn’t it? So here I am tom-toming about the book, how it was conceived, the people involved, how it evolved, how it finally came to fruition and all that good stuff you know. So we start during the summer of 1979 in a hospital in Chennai. But wait. This is a blog post, not a book! How about cutting out 25 years and heading straight to a nondescript cubicle stashed away somewhere within the gargantuan campus of one of India’s leading IT companies. But that would still be at least a short story worth of stuff on how one fine day suddenly I dozed off in the middle of coding when the God of writing came in my dreams in the form of a buffalo and said “Write” and how from then on I started on the relentless pursuit of my muse. So cut out another decade? What say? That would fit nicely in a blog post. Thus we arrive in circa 2014. It is the month of November. For most people, it is just another month. But for a group of people passionate about writing, it is the National Novel Writing Month fondly known as the NanoWrimo. Basically what happens is a large number of people get together to write the first draft of their novel. The ones who managed to write 50,000 words are declared winners and given certificates. So I had this November when I did not have much to do at office. So I wrote. A good 60,000 words I wrote – a novel that is never going to see the light of day. It was an idea that had been doing rounds in my head for a couple of years – people from modern world taking on the twelve labors of Hercules. I made the people from modern world management consultants the profession being my bread and butter. Instead of sending them to the past I sent them to the future, a post-apocalyptic dystopian future, where Hercules' quests are recreated. I kind of enjoyed creating the world but felt I kind of mixed up two very different ideas – a satire on management consulting using a parody of Hercules quests and a genuine adventure story set in fantasy world created by me. So decided to do them as two separate novels rather than force two swords inside a single scabbard. So what does all this have to do with the story I had written? Well, I am coming to that –so the group of people participating in the NanoWrimo developed a good camaraderie during the interactions on online forums and we decided to put a short story each and come up with an anthology. That’s how this book was conceived. My story in the book is titled ‘Damned for Eternity’. It is a spin off from the aborted novel. As the story evolved, a very interesting antagonist arose in the novel. I began to think about this backstory which I did not include explicitly in the novel. So I decided to write a short story covering this backstory. I am planning to write quite a few more of these backstories regarding the various sub cultures to make the world richer before I put in a story in the main novel. The tale of the consultants is being already written as a separate novel where the focus is only on the satire and not on the world building. Now garrulous fellow that I am, I can go on and on about my story – giving a commentary longer than the story itself. Rather than get into that territory let me tell a bit more about this book and distribute some credit where it is due. 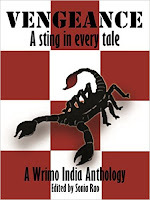 The book is titled ‘Vengeance – A Sting in every Tale’. As the title suggests the theme is vengeance. The book has 21 stories by 21 different authors and covers almost every possible genre with vengeance and NanoWrimo being the only uniting factor. Pritesh Patil was the originator of the idea. Sonia Rao is the chief editor and was supported by Dola, Neelesh, Rubina, Mansi, Varun and Pritesh in various capacities. The editorial team went about the hard task of calling for entries, sifting through the various entries and selecting the ones with potential, suggesting edits to the writers and finally consolidating all the entries, copy editing, formatting and launching a book. Phew! A whole lot of stuff, isn’t it? But the team worked relentlessly and managed to do all this. A lion’s share of the work was taken up by Sonia and Neelesh. Nikita Azad and Sujata Pattnaik have designed the cover art. The book was launched at Litventure, a literary festival in India organized by Neil D’Silva (and his team) who is also one of the authors in this book. So as you can see this book, like a movie is a year's labor of love of not just 21 authors but so many others. My hope is it turns out to be a blockbuster movie and gives a few joyous hours to lots of readers. The book can be purchased at one of the sites given below. Currently the book is available only in Kindle format. Based on reader response, we might go in for a print edition at a later date. All right! That was one hell of a preface to a sci-fi antholgoy. That does explain your relative absence for a while now. Mixing up Hercules with the creatures of corporate land sounds just like you! Wish you a mountainload of readers! Thanks a lot for the wishes, Umashankar.